Managing food allergies and dietary restrictions in a wedding menu is no joke. Guests should feel both comfortable and excited to dig in to that flawless menu — here's how to make sure that's the case. 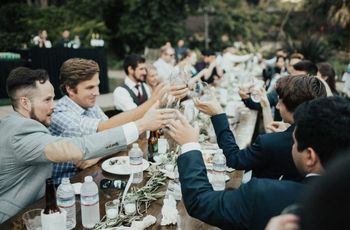 One of the goals for your wedding should be to ensure that your guests feel comfortable enough to let loose and have a great time. For guests with food allergies or dietary restrictions, making sure they are able to eat without worry is a big deal. We asked caterers from around the country to share their best advice when it comes to handling food allergies and dietary restrictions. 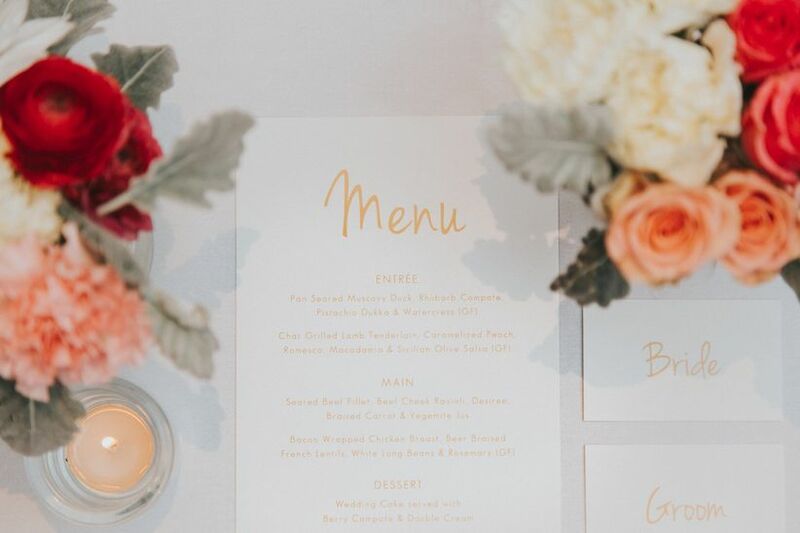 When interviewing wedding caterers, ask about if they have experience customizing menus for guests with dietary restrictions and food allergies. For most caterers, this won’t be an issue, but it’s always worth checking. Some caterers even have preventative measures in place already—for example, using rice flour or making all sauces gluten - or dairy-free. For guests with allergies or dietary restrictions, seeing an advance copy of your menu (even just the entrée options) will allow them to note any red flags. Your caterer can provide a more detailed ingredient list upon request. 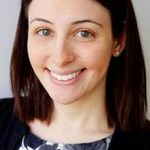 “Some couples will physically write out what their menu is going to be on the invitation so that if dietary needs come up they have an idea what the menu is. I think this works best,” says Devin Christine Johnson of Fork & Flair Catering in New Hope, Minnesota. 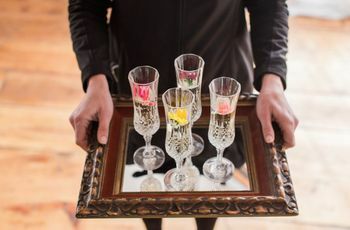 You can also direct guests to your wedding website and include menu details (and a request for information on allergies or restrictions) on your site. For buffets and food stations, it’s a good idea to label each item to note if it’s gluten-free, dairy-free, nut-free, vegetarian, or vegan, says Madeline Neville of Madeline's Catering in Rochester, New York. If you’re having a buffet or food stations, cross-contamination may be an issue for those with allergies or restrictions. “Depending on the situation we may have guests with allergies go to the buffet first so there’s no cross-contamination,” says Neville of Madeline’s Catering. If you or your future spouse have dietary restrictions, think about how you want to handle it on your big day. 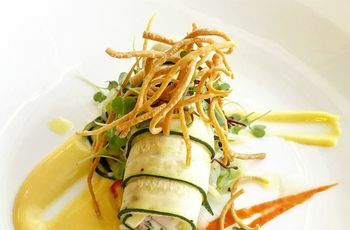 If you’re vegan, you can have an entirely vegan menu if you would like, but think about your guests, too. You might choose to serve some vegan and some non-vegan offerings to appease everyone. 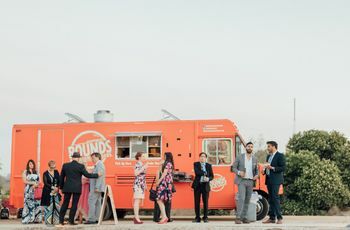 “Most of the time, if a bride or groom is vegan, they don’t want all of their guests to have a vegan meal, so we’ll prepare a special meal for the bride or groom,” says Matt Kar of Christopher Michael Catering in Jamesport, New York. But in the end, it’s your call based on your personal preference. Desserts can be tricky for those with gluten intolerance. If you know that some of your guests have these dietary restrictions, it might be worth getting a few gluten-free desserts (your cake baker can likely help with them) so they can enjoy a sweet treat along with the rest of your guests. Just make sure that these are properly labeled.